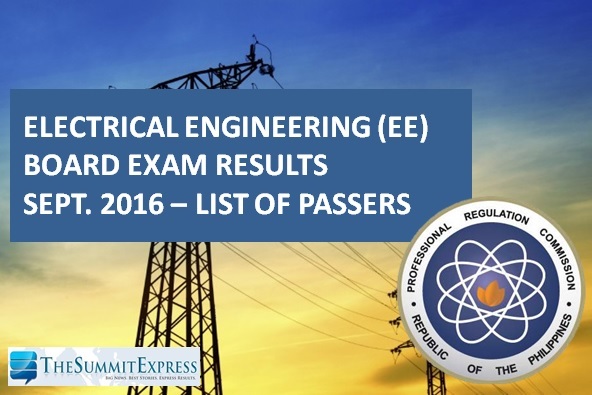 Those awaiting results of September 2016 Registered Electrical Engineer (REE) and Registered Master Electricians (RME) board exam can find here the complete list of passers, top 10 (topnotchers), top performing schools and performance of schools as the Professional Regulation Commission (PRC) and the Board of Electrical Engineering released results in at least 3 working days after the exam. PRC on Wednesday, September 7, announced that 2,817 out of 4,115 Registered Electrical Engineers and 2,525 out of 3,709 Registered Master Electricians successfully passed the Electrical Engineer Licensure Examinations. The second Electrical Engineering board exam this year was administered on September 2 and 3 (REE) and September 4 (RME) in the cities of Manila, Baguio, Cagayan de Oro, Cebu, Davao, Iloilo, Legaspi and Lucena. The two-day exam for REE covered the following subjects: mathematics, engineering sciences and allied subjects (Day 1) and electrical engineering professional subjects (Day 2). For RME exams, it covered technical subjects ( i.e. basic electricity, test equipment and electrical measurements) and Philippine Electrical Code. According to PRC, the target release date of the recent Electrical Engineer board exam results is on Wednesday, September 7 or in 3 working days after the test. In September 2015 exam, PRC also announced results in 3 working days. 2,536 out of 3,772 Registered Electrical Engineers and 1,886 out of 2,993 Registered Master Electricians successfully passed tests.